Although the library has undergone many changes in its history, one feature has remained constant: its dedication to providing services for the community. This dedication was tested during the Flood of 2006. The flooding that occurred in the Southern Tier area in late June of that year was often referred to as a “100 year flood”. Deposit was one of many local communities devastated by floodwaters. The Delaware River and its feeder streams overflowed their banks and wrecked havoc on many homes and businesses. The Deposit Free Library was one of the casualties. The library building was surrounded by water. Floodwaters filled the entire basement to the ceiling and covered the main floor to a depth of 5-6 inches. Damage to both the building and the book collection was extensive. Every book from the bottom shelves in the children’s and non-fiction rooms was water-damaged. The flooding couldn’t have come at a worse time for the library. A major renovation project was underway. The building’s carpeting was less than a year old. The computer workstation had been in place for less than a month. The hot water heater was brand-new. 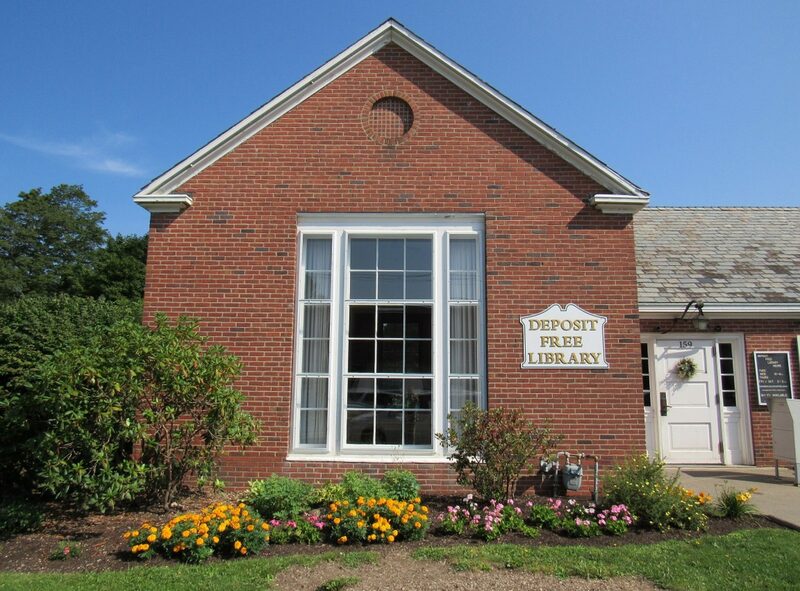 For the first time in its history the Deposit Free Library was closed due to a natural disaster. Trustees set a goal of August 1st for reopening. In order to save the book collection, drying out the building was of paramount importance. The basement was pumped out, all the windows in the building were opened, and an industrial dehumidifier was run continuously for two weeks. The basement ceiling was removed. Baseboards were removed in all affected rooms so the plaster walls could be mildew treated and repaired. Thanks to quick work and thorough drying efforts, the new carpet was saved and professionally cleaned. Many hours of volunteer labor were devoted to the clean-up effort. Library trustees were joined by dozens of community volunteers. They pitched in to remove damaged books. Experts advised that returning mildew-damaged books to the shelves would contaminate the collection, so the difficult decision was made to throw away over 1,100 titles. Recovery was a two-fold problem. Although there was no shortage of people willing to share their time and talents, money to pay for the necessary repairs was another story. The entire heating system and hot water heater had been destroyed. The cost of book replacement alone was staggering. Total recovery costs reached $50,000. Trustees navigated the maze of federal regulations for disaster relief. Because the library was a non-profit organization, aid eligibility was often questioned. Library personnel were shuttled from one agency to another. At one point there were eight different grants in varying stages of completion. It took a full five months to receive federal and state disaster relief funds. Although government agencies moved slowly, friends of the library responded quickly. Donations poured in daily. Local residents and organizations were incredibly generous, and former Depositonians from all over the country sent contributions. Over $6,000 was donated during the first six weeks following the flood. One of Deposit’s largest industries, the Norbord Corporation, contributed an additional $5,000 to the recovery effort. Three fundraisers were held during the summer months. Volunteers held two book sales on the library lawn, and fifth grader Kayleigh Lobdell held a benefit bake sale. Individuals and organizations also contributed books to restock the shelves. DCS teachers contributed children’s books from their personal collections. The publishing houses of Penguin-Putnam and Houghton Mifflin sent hundreds of children’s books. A Girl Scout troop from west Nyack, New Jersey adopted the library, organized a book drive, and personally delivered a pickup truck full of books. A massive day of cleaning took place to prepare for the reopening. Volunteers polished woodwork, spackled plaster, vacuumed carpets, and washed windows. Books that had been moved and boxed during the flood were sorted, alphabetized, and reshelved. Technicians got the computers up and running again. On July 27th, one month from the day the doors were closed, the library was reopened. The reaction to the Flood of 2006 once again proved the value people placed on their community library. The support received in the aftermath of this disaster was overwhelming. The library survived one of the most difficult times in its history, thanks to the dedication of its friends.